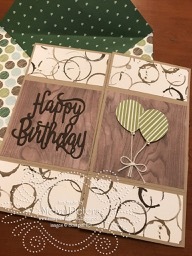 Stamp with Melva: More Birthday Cards! As I mentioned in a previous post, I have lots of family and friends with birthdays in September and October. Here's a birthday card I made for my husband's birthday. He has some high expectations for birthday cards - can't just be an ordinary card, I have to make it a fancy fold card and I have to beat the card I made last year. It gets harder and harder. This year I decided to make a never ending card which I've never made. I found a tutorial online which was great but the size turned out to be 8x8". It's fine for giving in person, but I wouldn't want to have to mail it! I used a bunch of different SU! products on this card.